Would you like to help me to make www.homeschooling-ideas.com more inspiring than ever? I promise it won't take long! And as a thank you, I have a free ebook for you to download. Just fill in the form below and you will be given a link for your downloadable Daily Do-Its ebook on the next page. Please be as detailed as you can in your answers. I genuinely want to help you be more inspired in your homeschooling - and I can do that better if you help me understand what your challenges and frustrations are. What age range are your children? What are your biggest challenges with homeschooling? 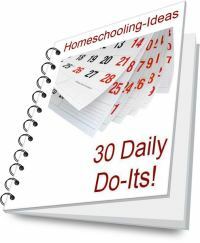 Why are you interested in ideas and activities for homeschooling? What is your biggest frustration about finding ideas and activities? What is your biggest frustration about doing ideas/activities with your children? What would you love your homeschool to be like? What do you feel is missing on Homeschooling-Ideas.com that you would love to see? Thank you so much for your help. I hope you enjoy your free ebook!